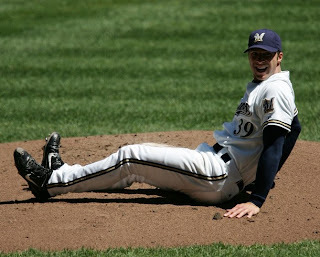 Capuano, Brewers, Decide to Try This Again ~ The Bucky Channel - The World of Sports from Wisconsin's Perspective. He won 18 games in 2005, was voted an All-Star in 2006, struggled in 2007, and then destroyed his elbow in 2008. The first Chris Capuano Era was met with mixed results, but now both he and the Brewers are ready to give another go at it. After wisely deciding to not offer Cappy arbitration, the Brewers have instead offered him a "heavily incentive-based" contract, according to MLB.com's Adam McCalvy. It's a minor league contract, and it's anyone's guess as to where Capuano will be pitching come next season's Opening Day. Personally, I've always liked Capuano, if only because of his uncanny resemblance to a friend I have, who is also named Chris. 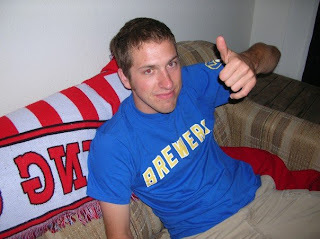 While the Brewers need to do a lot more than this before I'm comfortable with their rotation, both me and my buddy Chris approve of this low-risk, high-reward move. Elsewhere, the Brewers and Yankees appear to have met a stalemate regarding the Cameron / Cabrera trade talks. What Are You Doing Wednesday? LIVE BLOG! We Lost CC, What Next? The Brewers Didn't Get Sabathia. Whew. Mrs. Donovan, Your Son Is Moving Home! Could Williams Suspensions Save Packers Season?